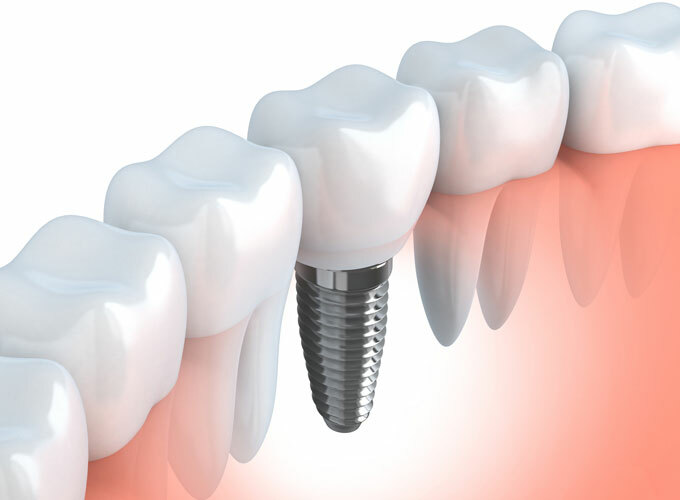 Dental implants are a technique used to replace either a single tooth or several missing teeth. Implants and their attached crowns are the tooth replacement option which most replicates the look and function of natural teeth. Tooth replacement is achieved by the insertion of a metal tooth root (titanium screw) into the jawbone as an anchor for the artificial tooth (crown) to be placed onto. This technique is suitable for most cases where the tooth has been missing and adequate bone level remains. Consultation with Dr Malakonakis will determine whether a dental implant is the best option for you. Implants can also be used to help support and stabilise a denture and provide you with greater confidence and comfort. Dental implants have the advantage of working independently of your other teeth and not compromising otherwise healthy teeth. Many people think of missing teeth as primarily a cosmetic dentistry problem. Missing teeth do certainly leave you with a gapped, unattractive, un-photogenic smile, however, a lost tooth presents a number of significant dental health issues, issues that must be addressed by a dentist. Ideally those who are missing a tooth or multiple teeth should get them replaced immediately. Emmanuel and the staff at Gymea Dental want to help you avoid the pain and awkwardness that comes from missing teeth. Tooth replacement isn't just good for your smile, it's good for the health of your mouth as a whole. Losing a tooth as a child is not usually a big deal; lose a baby tooth, and before long a new tooth will grow in to replace it. We understand that things are much different when you're an adult. No natural replacement tooth is on the way. And everything in your mouth plays a vital role in its operation; you can't lose a tooth without witnessing the repercussions. Each option has its own advantages and disadvantages and not every option may be suitable for you. Feel free to discuss these with Emmanuel and the staff at Gymea Dental to find the procedure that is right for your specific needs.